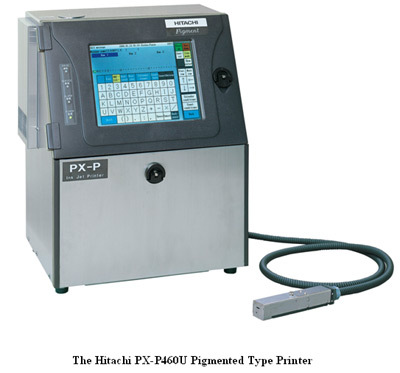 HITACHI INTRODUCES NEW PIGMENTED TYPE PX-P460U SMALL-CHARACTER INKJET PRINTER : News Releases : Hitachi America, Ltd.
TARRYTOWN, NY, May 2, 2004-- Hitachi America, Ltd., Power and Industrial Division, today introduced its newest small character continuous ink jet printer. The PX-P460U Pigmented Type Printer has been designed to provide superb coding on the black and dark surface products such as, but not limited to, automotive parts, electrical and electronic devices, steel and injection molding products. Hitachi has been manufacturing small character continuous ink jet printers since 1975. The PX-P460U features a 10.4” color LCD touch panel with full intuitive menus on the screen providing easy and quick operation and maintenance. The PX-P460U deploys a newly developed unique and innovative ink circulation system, including automatic intermittent mechanical stirring system, which maintains precise pigment suspension and helps reduce fluid evaporation and achieves a very low cost of operation. Nozzle and gutter are automatically cleaned before shutdown. The new viscosity and density control feature provides stable ink drop formation and keeps print quality high. For further information contact Hitachi at inkjetprinters@hal.hitachi.com. Or visit the company online at www.hitachi.us/ijp. To learn more, please visit Hitachi at Interwire 2005 Booth#3213, May 16-19, 2005, Georgia World Congress Center, Atlanta, GA and at East Pack 2005 Booth#4413, June 13-16, 2005, Jacob K. Javits Convention Center, New York, NY..